As much as I would love to wander through fields of corn and have meandering paths through plots of carrots, peas, and potatoes, that just isn’t a reality where I live. Where I live is less than 1/4 acre. When you figure in the house and garage, the chicken run, the kids’ play area and the big patch of death under a huge pine tree, there isn’t a lot to work with. 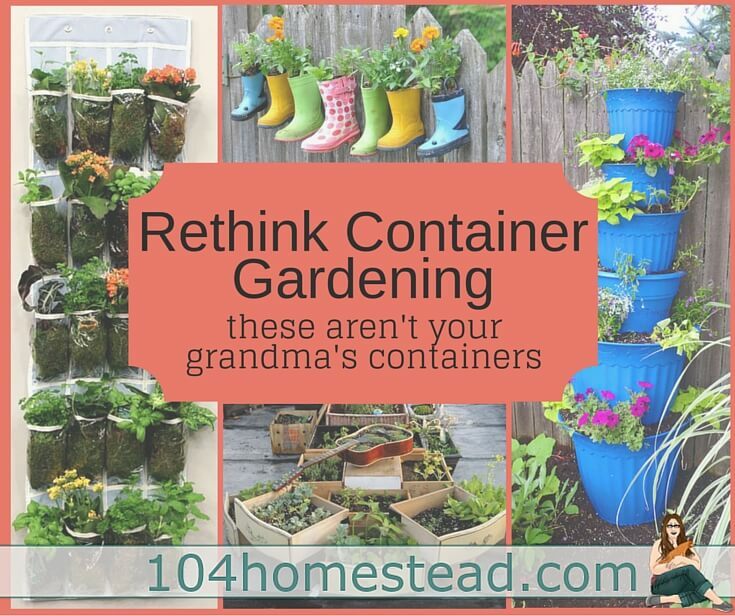 That is where container gardening comes into play. It’s just one of my small space gardening tricks. 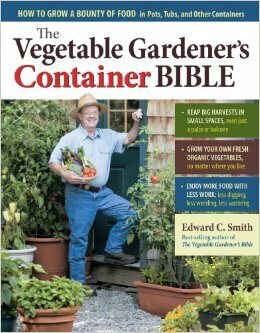 Container gardening is turning over a new and updated leaf now that people are going back to growing their own food. You use to just get a plastic pot from the nursery and stick a tomato in it, but that was before. People are thinking outside of the box and coming up with new and innovative ideas on how to put a garden where a garden wouldn’t necessarily go. They’re also using gardening methods like Back to Eden in their containers. 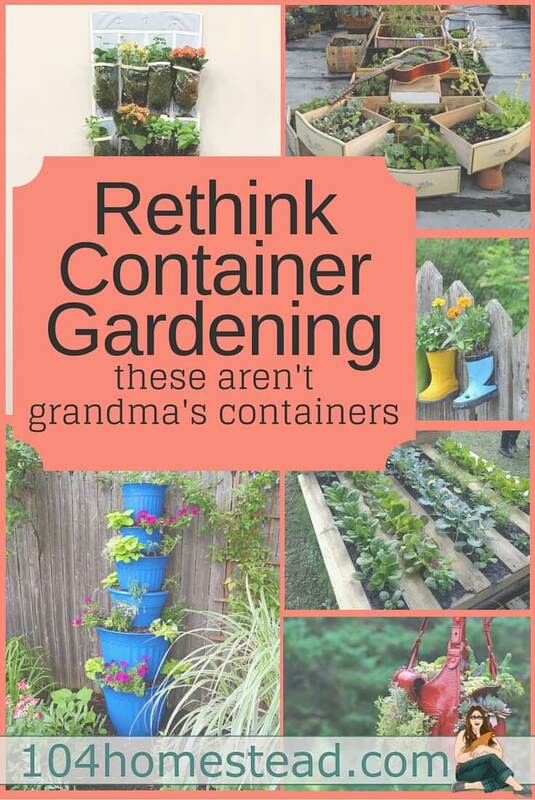 This isn’t your grandma’s container gardening! Who says containers can’t be super cute? Garden design is important, especially if you’re trying to fly under the radar of an HOA. In our great strive to make the world a better place, why not re-purpose something that you scrounge up or already have on hand? 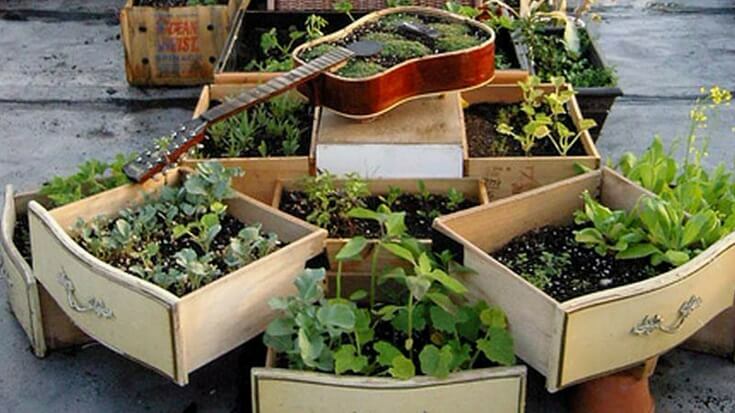 Here someone used everything from shipping crates and old dresser drawers to a guitar! How cute would that be for a musically inclined family? Look around your home and see what you have lying around that could fit some dirt into it. Many vegetables have shallow root systems and therefore don’t need a big deep garden to grow in. Short on space? Why not grow up! This show organizer is re-purposing at its finest. I know that they say it fits 24 pairs, but they must be talking children’s footwear because I can never fit more than one shoe per pocket and that is a lot of real-estate for 12 pairs of shoes. 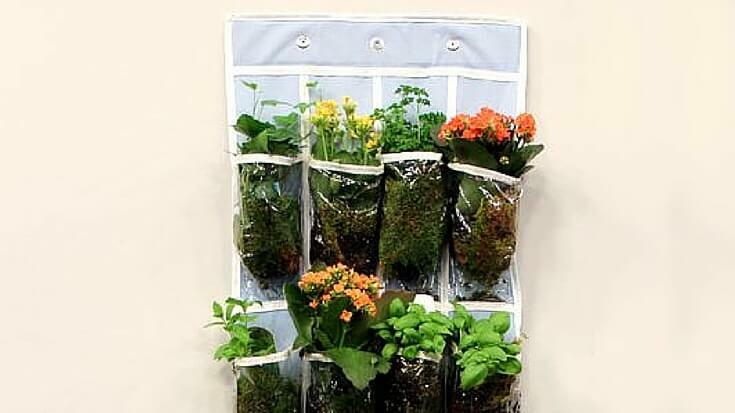 I’d much rather use the plastic pockets for growing my favorite herbs right outside the kitchen door. I’d highly recommend cutting several small slits at the bottom of each pocket so the water can drain. Also keep in mind that the plants on the top are going to drain into the plants lower down. Be sure not to over water or maybe plan out which order to plant them in based on their watering needs. Maybe a shoe organizer isn’t sophisticated enough for you. 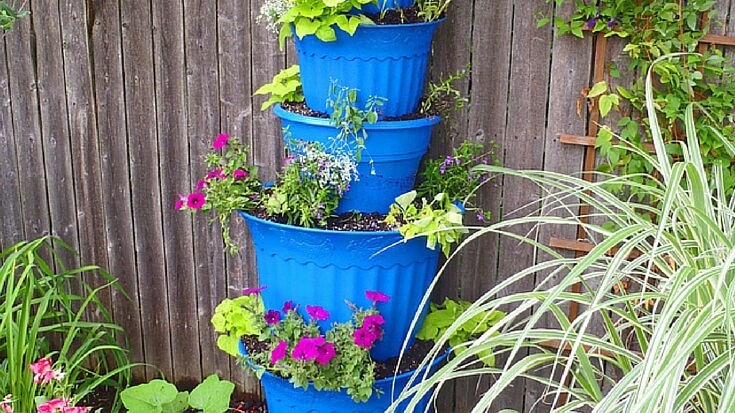 This happy garden used the cheap containers you get from the nursery and end up throwing away to make a vertical garden that looks like a work of art. It is simply amazing what a person can do with a can of spray paint and a dowel. My advice is that you fill the bottoms of the containers with something lightweight (like packing peanuts) so your tower doesn’t weight hundreds of pounds. When using a filler at the bottom of a container it is wise to cover the filler with a garden cloth that will not allow contaminants to get into the soil. Try utilizing wasted space. I have an ugly privacy fence along the back of my property that this would be perfect for. As much as I would love to have plants growing in front of it to hide the hideousness, it’s my children’s play area. My toddler would tear up any attempt of gardening there, and since he’s only two, I fear he’d eat something he shouldn’t. Instead, I’ll distract them with whimsy. Be sure to drill holes in the bottom of the rain boots for drainage. And while we are discussing hanging your plants, why not utilize an old purse and hang it in a tree (provided it doesn’t cast too much shade or you want to plant shade tolerant plants). Many herbs have low light requirements and would fit beautifully in the chap-stick or cell phone pocket of a purse. You could even utilize the big pocket as a bird’s nest. How fabulous would that be? 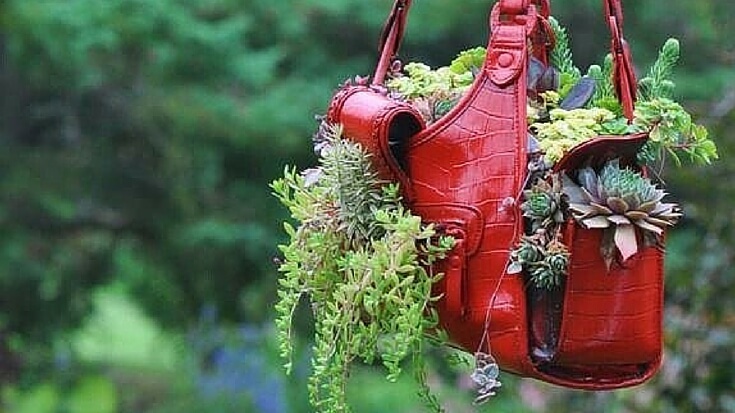 This cute planter idea probably wouldn’t last for too many seasons, but what lady doesn’t have a huge collection of purses? 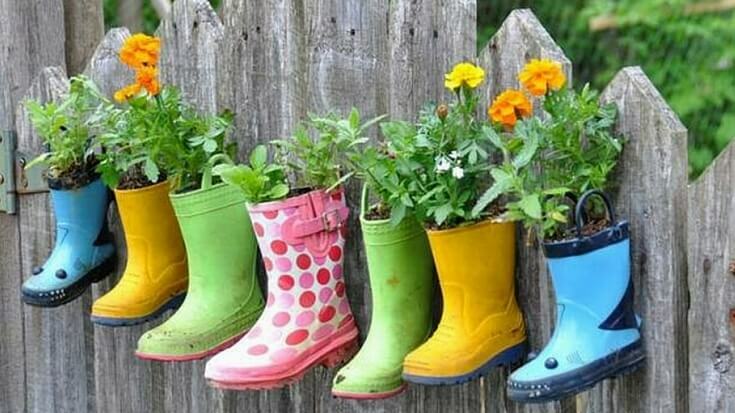 What better use for them than container gardening? Get more inspiration from this photo contest at Dave’s Garden. Lastly, we come to the ever-popular pallet. 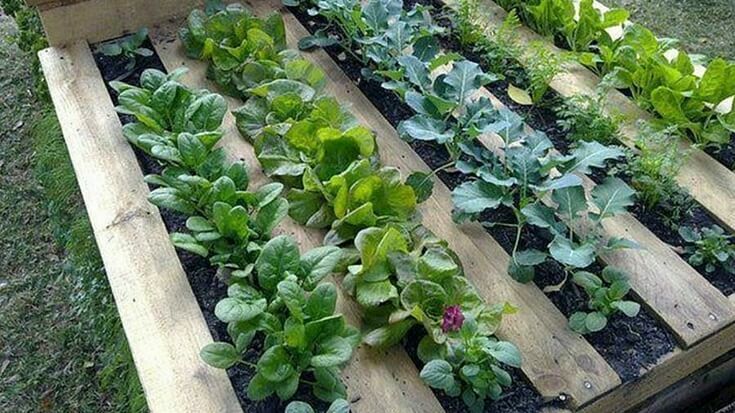 Pallets can serve so many purposes in the gardening world. They can make raised beds, vertical garden, compost bins, walking paths and so much more. The slats on this example make for the perfect rows. And who doesn’t love a little organization in their lives? There are some things to consider, however, before you start hauling home pallets by the truckload. Safety is very important here since it will be affecting the food you put in your mouth. Make sure that the pallets you use are either untreated or heat treated. Some pallets may contain chemicals. How do you know if it is safe to use? Look for the code HT (which is safe for edible gardening) and be sure they are from the US since some countries do not mark their pallets. You can learn more about pallet labels at 1001 Pallets, which also has loads of project ideas that use pallets. Details for making a vertical pallet garden can be found at Growing a Greener World. There are a few others you may not have considered for container gardening. Some fruit trees and shrubs can be grown outside of their natural growing zone when they are planted in containers. Examples include apples, kumquats, avocados, blackberries, blueberries, pomegranates, cherries, figs, and pears. Citruses like oranges, grapefruits, tangerines, lemons, and limes can be grown up north so long as they are brought indoors from late fall to early spring. You can even try your hand at bananas, pineapples, papaya, and guavas in containers. For more information on gardening and growing, plus other great homesteading advice, subscribe to The Homestead Helper. HT is safe for garden projects. The code indicates that the pallet is heat treated, not chemically treated. Hi Jessica I signed up just a short while ago, and just wanted to say what you are doing is very interesting. I’m not homesteading just yet but am really looking forward to some container gardening and maybe get a few chickens and a couple turkies.